This schpiel is a list of information related to the Phone Company/ICE (pronounced Long EEEE – say) in Costa Rica - everything from how to do Call Waiting, Call Forwarding, Voice Mail, Wake-Up Calls, etc.!!! 1113 - Information- Residential (like 411). 1115 - Customer Service (Land Lines) - Phone - Changes - including Call Waiting, Call Forward, Voice Mail - The initial recording is in Spanish. CODES: 1-general/promotions (automatic), 2-Billing, 3-Verify Changes, 4-Other, 5-Operator, 6-Things involved when you use your password. 1119 - Technical Problems - Phone - This is automated where they ask you to punch in your number - BUT - if you do NOT put your number in, a LIVE person will come on. The automated calls are of course in Spanish but often, when I've called departments where I had to speak with a live person, they usually had SOMEONE that spoke English (& I'd throw my Spanglish in & we all laughed!!!) so don't get all nervous if your Spanish is limited. You CAN do it!!! HOW CAN YOU TELL IF YOU'RE CALLING A LAND LINE OR CELL PHONE? Calling a Landline in Costa Rica is SIGNIFICANTLY cheaper than calling a Cell Phone & time of day makes a difference as well. Calling to a Costa Rica Cell phone from other countries is LOTS more expensive as well. It's a bit harder now that the monopoly has been broken & new companies have come in - so how can you know what type of phone you're calling? ICE•Kolbi Land Lands start with a "2".MovieStar Land Lines phones start with a "4"
ICE•Kolbi Cell Phones start with a "3" or an "8" or "9"
MovieStar Cell phones start with a "6"
Claro Cell phones start with a "5"
FREE VOICEMAIL, CALL WAITING, CALL FORWARD & EVEN FREE WAKE UP CALLS!! Other than Voicemail, I was able to activate Call Waiting & Call Forward by just calling 115 - Customer Service. I'm SHOCKED at how few even Tico's know about this!! NOTE: On Land Lines, the prompts are in Spanish so here are the instructions in English. EXCITING NEWS!!! You can get your CELL PHONE (ONLY) set up so ALL the prompts are in ENGLISH - even the voicemail prompts your callers get!! To do that, go into ICE & ask them to do it (you can do it for yourself on your cell but that won't set the voicemail message prompts). The prompts are basically the same as Land Line Phones. You know you have a voice mail message when you pick up your phone & there is a lady's recorded voice. YES - you CAN STILL dial out - just start pressing the number & she'll stop talking. I sure wish someone had explained that to me in the beginning as this one only took me over a month to figure out of complaining the phone was not working and them not understanding me). The codes are basically the same for cell phones and land lines. CALLER ID - Also free but you must have a phone that has that feature (showing the number) and you set that up. This one also requires the same proceedure as setting up International Access/Block. DIDN'T GET YOUR PHONE BILL (NOT that unusual)? Go to a ServiMas (where you can pay your bills, receive/get money wired & also get your U.S. dollars converted into Colones [but you can NOT buy Dollars with Colones} for NO extra fee [most banks charge a fee to convert money if you don't bank with them - like in the States often]) which are located at Mas x Menos, Perimercado, Pali, Hipermas (all now partially owned by WalMart). You can also pay them at Fischel Farmacia/Pharmacy. FORGOT TO PAY YOUR BILL and you were Shut Off? http://www.EscazuNews.com Daniel said do NOT go to ICE but go to Banco de Costa Rica & as SOON as you have paid - call 115 & tell them it is paid. NOTE - if you have TWO bills past due - they can take your phone number away! Don't want your employees or guests to ring up your bill? You can put a Block/restriction on your phone so no one can MAKE International Calls AND you can put a Block so you can NOT RECEIVE International Calls (Patrick helped me understand why one would have this - that is to block outsiders [like staff] from receiving EXPENSIVE collect calls - ahhhhhhh!!!!). To permanently restrict international calls - the person who's name is on the phone bill (ONLY) must fax a letter to 283-2121 along with a copy of their id (cedula or passport) requesting the action (or bring it into an ICE office). WARNING: The person who's name is on one of my bills has "left this planet" & I was told it would entail some sort of legal/courts type of change. You CAN restrict it Temporarily by: To Activate: Press */star, 33 and */star, then your four digit password and “#”/the pound key. To Verify it's active - *#33#. De-activate - #33*, password & “#”. DRAWBACK: Not only can Collect International Calls not come in but nor can your family/friends calling you from outside of CR (they'll get a recording [I can't remember if it's in Spanish or English]). I haven't found many cheap copies let alone business cards and brochure printing in Costa Rica. WANT REALLY GREAT CHEAP BUSINESS CARDS, ETC.?? Have someone coming to visit you from the States? In the past I've had my printing materials done at Beyond Imaging in the San Diego area. They have a special of 1,000 business cards in COLOR PLUS you can get black & white on the back for just $99 (plus a set up fee & some misc. fees if you have more technical things but they're nominal). Tell Jon or Barry that Vallarta Vicki referred you!!! EFFECTIVE at midnight on MARCH 20,'08 EVERYONE gets to add a “2” in front of ALL Land Line Phone numbers and an “8” when calling ALL cell numbers (note that ALL cell phones within CR start with either a 3 or an 8 making this new step easy to figure out). If you have business cards, brochures, websites, etc. - that means you get to change all that also!! (note, just the other day I went to get new biz cars and the guy didn’t even tell me about it [ahhhh “customer service”!!] so I get to remake more cards at MY cost!!). You’ll also HAVE to reprogram all the numbers in your speed dial on your home phone and cell. There will be NO change in Costa Rican 800, 900 or 905 numbers. Unlike most pages listing AA Meetings - this page is NOT "official" or attached to any organization so I CAN share all sorts of other resources you can't on more "official" recovery sites! "Healthfood stores" in Costa Rica are called "Macrobioticas"
(where you can find MANY natural vitamins, tinctures and some herbs)! Shipping: You might SERIOUSLY want to rethink that as those items, if properly labeled WILL most likely get stopped and you get to jump through LOTS of hoops, time and expenses to get them out of the Eduana including YOU getting some special Health Permits. 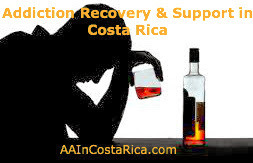 For now, Holistic treatments are ok (operative word - “ok”) in Costa Rica but there has been much talk about getting it all licensed (who in the U.S. government are they hanging out with or might it be the LARGE drug manufacturing company presence that is here?). Escazu (San Rafael) (289-8965) - OWNERS: Jose & Zeneida HOURS: 9:30am-7pm. LOCATION: in the little strip mall behind Mas x Menos on Calle Vieja, just West of San Rafael (THANX Margie). One of the oldest in the country and they sell a tons of products every week. DIRECTIONS: In front of Burger King in Tibas Centro. San Pedro (2-225-8062 / NSPSanPedro@ice.co.cr) - 200 mts North of Pizza 2x1. (2-468-0352 / 8-369-7415 / orgbot@sol.racsa.co.cr / www.NewChapter.com) grows MANY of their FANTASTIC ORGANIC products that are sold in the U.S. and Canada at their Luna Nueva Farm in La Tigra 2 1/2 hours north of San Jose, on the road from San Ramon to Fortuna. ACCOMMODATIONS: And they even have a Lodge at their BEAUTIFUL Finca Luna Nueva Lodge in San Isidro de Penas Blancas in San Ramon (2-468-4006 / 2-68-0352 / http://FincaLunaNuevaLodge.com / info@FincaLunaNuevaLodge.com) with prices starting at $60 for 2 (less $10 for a solo) in Green Season (+$10/n in High Season plus 16.39% tax) and that includes a full Breakfast Buffet PLUS a Cultural Tour around the finca plus the use of their Natural Spring-fed pool, a solar heated Jacuzzi, WiFi, a Restaurant serving home cooked, natural and organic meals - 90% of which is created from fruits and veges from their garden and they have their own goats and cows producing their own yogurt and cheeses (yummmm) and bake their own breads (what meat and fish they offer for meals is raised in healthy settings), Hot Water, Hammocks, Climb their 16-mtr/50 ft Observation Tower and catch a glimpse of the Arenal Volcano, Volleyball, Ping-Pong, Table Soccer, Board Games and they also offer Spa/Massage Services, Laundry Services, Mountain Bike and Horseback Riding. Acupuncture & AURICULOTHERAPY - Amazing Results!! Have I a treatment for you that’s had AMAZING RESULTS for most of the people that I’ve shared his info with! Eugene "GENE" McDonald (352-0661 / acutherapy0@hotmail.com) in Centro Escazu has a VERY unique machine that I've seen over & over to have AMAZING results!! It's called AuriculoTherapy - like acupuncture but without needles - an electric stim type gizmo that goes around the acupressure points inside your ears which then goes to various organs, etc. (Chinese medicine going back THOUSANDS of years!!). I've seen MANY MANY other people have AMAZING RESULTS in just one or two visits in LOTS of other areas with AuriculoTherapy!!! I have PERSONALLY known MANY people that have had BIG SUCCESS with Auriculotherapy for things like NECK, SHOULDER, ELBOW & BACK (recently I had a guy at my place that could barely stand. After one visit to Gene he was DANCING!! ), SCIATICA (I had a guest that had sciatica for YEARS & got off a plane in INTENSE pain. One visit & over 6 months later - NO sciatica & she was then able to do the zip line/canopy tour she'd always dreamed of but didn't think she could get up to prior to Gene), PAIN (I've know quite a few people that have gone to him for various pains from surgery related, falls, etc. that had GREAT results!! One person had an injury 30 years before & after one treatment - had FULL range of motion from his treatment. Another had an injury 3 years before & was 80% healed in 1 visit!! ), PMS (I have a friend that goes to him for period pains & HORRIBLE PMS with GREAT results & she’d been going to another popular acupuncturist for YEARS! ), WHIPLASH, SPORTS INJURIES, CARPAL TUNNEL, FIBROMYALIGIA, SACRO ILIAC, STRESS (I went for this t he day before leaving on a trip & my blood pressure was SOARING initially & afterwards I was 80% calmer after just one visit!! ), TENSION, HEADACHES, MIGRAINES (I've known quite a few people that have EXCELLENT results with this), DEPRESSION (I had a friend that was literally ready to go OVER the edge that went to Gene & survived & is thriving!! ), ADDICTIONS FROM ALCOHOL, SMOKING, DRUGS, FOOD (REALLY GOOD results. I had a guest that was at the point of drinking straight rubbing alcohol & had been drinking heavily since she was 8 years old & after just 3 days [of a 30+ day program] & 6 months later, the thought of alcohol STILL, over 6 months later, makes her want to throw up & she's been challenged every day by an alcoholic boyfriend but no drinks for her yet!!! My perception is that it helps tremendously for people to get off the "iction" [though emotional therapy is still a REALLY important enhancement for long term results with this I believe!!! We ALL must deal with our "stuff" that creates the "izm" that we ALL have & unfortunately AuriculoTherapy doesn't do that so therapy is REALLY important to do with it I think]), ANXIETY, INSOMNIA, FATIGUE, EPILEPSY, FLU-COLD, SINUSITIS, HEMORRHOIDS, TMJ, FACIAL PARALYSIS, APPETITE, VOMITING, ARTHRITIS, KIDNEY STONES, HEMIPLEGIA, ONE-SIDE PARALYSIS, CONSTIPATIONS, DIARRHEA (I know a pregnant gal that couldn't even hold down water & had horrible diarrhea & had amazing results immediately!!) & LOTS of other things++!!!! Some have even gone to him to get even better results than a Massage!! Your results/amount of time for healing can also take longer if the injury/illness has been with you for some time &/or is deep. My wish for you if you go to Gene is that you have at LEAST the success these people did or MORE!!!! INVESTMENT IN YOUR BODY/HEALTH: $30 for the first visit & $25 thereafter (possibly less if it’s a quick & easy thing). He’ll give you a FREE CONSULTATION if you’d like. Auriculotherapy is a clinically effective treatment modality utilized for the relief of chronic pain and the alleviation of substance abuse. The external ear has been shown to have a somatotopic organization in an inverted fetus pattern, wherein each part of the auricle corresponds to a specific part of the body. Detection of electrical conductance and tenderness palpation can reveal specific auricular reflex points which can be stimulated to alter pathological reflex patterns in the brain, in internal organs, and in different peripheral regions of the musculoskeletal body. LOCATION: Between Cuidad Colon and Puriscal - I've been to him and had AMAZING results when I was going through the darkest of the Dark Night of the Soul. ONLY for people REALLY FIT as it's a BIG hike down/up through this wonderful jungle! http://CostaRicaEventsCalendar.blogspot.com dedicated to keeping up on what's happening around Costa Rica for the local and tourist alike - something for EVERYONE!! Like life in Costa Rica, things are CONSTANTLY changing, details aren't available, some info is from previous years so dates change, etc. so if it is important to you/you are interested in attending something, try to contact them in advance. This is list BY FAR NOT a complete list and it will be updated regularly with other events, seminars and more details so check back regularly!! SADLY - ORGANIC OASIS IS CLOSED & SEVERIN STONE IS BACK IN THE STATES. A REALLY tasty & NEW RESTAURANT!!! A predominately VEGETARIAN menu along with some fish, chicken & egg dishes – a more TASTY, European/Fusion, standard HEALTHY fair with nice presentation! DAILY SPECIAL - an Entree with soup or salad – usually around 3,200 & add chicken or fish - +500-c (served throughout the day [or when they run out])! – KID-FRIENDLY. BOOK EXCHANGE. DELIVERY (in the area for a fee). Cash only. OWNERS: Mario Bello (former chef at ED) & Stephanie McPhail (tell her Vicki sent ya). HOURS: Tues- Sat. –10:30-8pm, Sun. 11am-5pm. Closed Mon. LOCATION: Escazu (San Rafael)-Trejos Montelegre – the street a block behind KFC – the east side of Hotel Maria Alexandra near where the art supply/classes store used to be. Getting there driving – from the main street where McDonald's turn West into the street at Vivero Exotica & Rosti Pollo are (it's a one-way street. Turn left at the first street, cross over the street that you would normally turn left on to get back onto the main road (by where KFC is) & it’s 1/2 way down on the Left. Costa Rica is REALLY lacking in GOOD QUALITY bedding/sheets! Typically the majority of the sheets/bedding I've found in Costa Ricadoesn't even have a thread count listed on it and often is quite rough/scratchy. My bed (a complete memory foam bed with NO coils [coils in a bed are REALLY BAD for anyone with High Blood Pressure, Pain and/or Arthritis!!!!]) is my SANCTUARY and I use soft/sensuous sheets of 600+ thread counts and have the MOST LUSCIOUS blanket I've EVER found!! I sleep so little so when I do, I want it to be a MAGICAL experience!!! With that said, below is a list of some places where I've found bedding of at least 200 count (again - finding thread count listed on sheets in CR is RARE so we start with what we have to!!). I LOVE THIS STORE!! DEFINITELY a "VIC's PIC!!!" This store is all about HIGH end QUALITY COTTON BED LINENS and TOWELS from known U.S. brands like CuddleDown, Home Source, International, Pine Cone Hill, Bliss Living - in thread counts ranging from 200-600 tc (standard in Costa Rica is NO number on the package to 200 thread count and most are polyester blends). They carry sheets for extra deep and extra-extra deep mattresses and are one of the few stores in Costa Rica where they have a LARGE selection of sheets sold INDIVIDUALLY so you don't have to only get king size pillow cases with your king set if you are really just desiring standard pillow cases - or you don't have to settle for a top sheet if you don't use one and only use a duvet. Mattress and Pillow Protectors•Covers•Mattress Pads - in Super Thick, Regular and WaterProof as well as Bed Defender Waterproof Mattress pads (made from non-plastic - noise free material). Comforters and Blankets (all 100% cotton). Euro Pillows and other Decorative Pillows in everything from synthetic, cotton and Down, Down Alternative with Pillow Cases in sizes from Standard, Queen and King. Duvet Covers. For the bathroom they carry Plush and MicroCotton Towels and nice bathroom Accessories, Hotel type Waffle and Terry Cloth (including some DELICIOUS THICK ones!!!). They're starting to carry Area Rugs in Over-Dyes (vintage carpets and Sari Silk. What's helped keep them in business for 7+ years is their quality and large selection! Andrea speaks GOOD English and is usually there Monday-Friday from 9:30am-2pm. ****Ask if my GOOD Bud/owner Brenda or her son Karl are there and give them a BIG HUG from me!!! Tell them Vicki (or the Living Life blog) sent you and receive 5% OFF!!!! HOURS: Monday-Saturday - 9:30am-5:30pmLOCATION•DIRECTIONS: Pozos de Santa Ana (aka "Lindora") - off the Pista at the Santa Ana/Airport exit. Head North (Right if coming from Escazu or Left if coming from Ciudad Colon) towards Pozos/the SJO Airport. At the street where Wendy's and the the MATRA heavy duty trucks/equipment rental/sales is (across from Bosques de Lindora), turn Right and back about 300 meters is a guard station is Bodega Los Higuerones #3 (though there is no sign [ahhhh Costa Rica!!]). Some decent quality bedding and some good prices. Plus they're adding more kitchen chachkees•chunches. Sheets from Europe and VERY elegant yet $$$$$! Upstairs from this AWESOME fabric store - they also carry bedding and bath things like towels and a few decorative bathroom things including some curtains (limited though I bought a BUNCH here!!) for GREAT prices also!! Of course it’s not the high quality I’m used to but the towels I bought here are better than most I’ve found in Costa Rica. Francisco is usually upstairs. (see also “Fabric”) and is one of my main buds there (he speaks some English). Gustavo Jop (one of the family owners). Speaks GOOD English and is there from 2-6pm usually.